While in Manila visiting family, I visited the newest weekend food market Soderno located in Madrigal Avenue in Alabang. Some interesting cheap finds in this place, but most of the fare are deep fried so this is not one for health-conscious folks. We tried out Bagwang Bagnet with Rice (Php 165 or SGD 4.90). 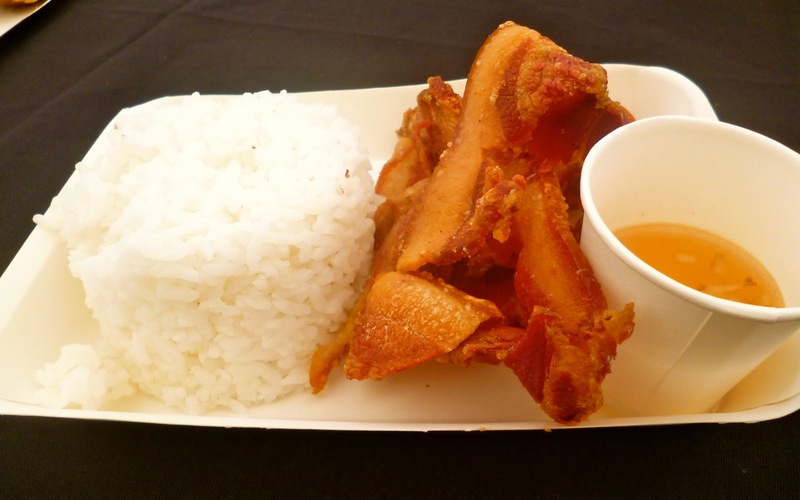 This is supposed to be an ultra thin version of bagnet, which is a regional dish of crispy pork belly found in one of the northern provinces of the Philippines. This rendition sad to say looked and sounded better than it tasted. Nothing great about this and the strip of pork belly was not nearly as crispy as it looked. I would rather have eaten a nicely fried piece of bacon instead. I also had some Manang's Chicken - 2 pcs Chicken with Rice (Php 136 or SGD 4.00). 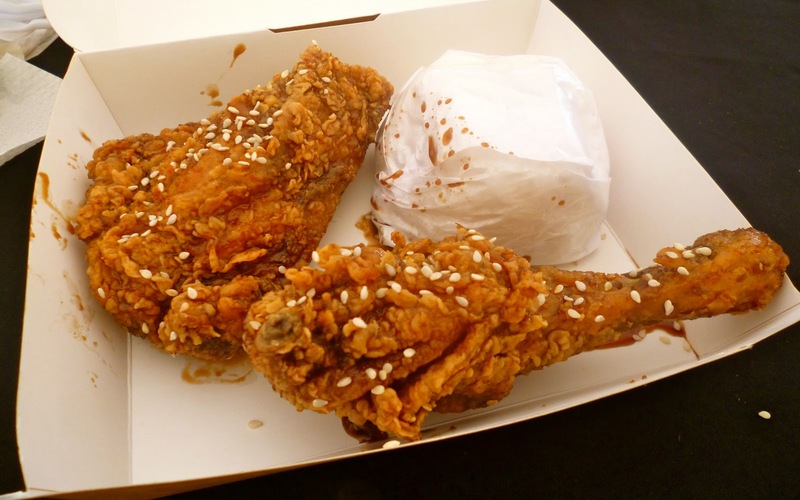 This is a twice cooked chicken, very similar to Bonchon Chicken in Singapore. I liked the addition of sesame seeds which I thought brought additional texture and flavor. I hear the chicken wings are even better since you get more portion of that ultra crunchy skin. Last in our list of fried goodies was Odyang's Okoy (Php 25 per piece or SGD 0.75 per piece). 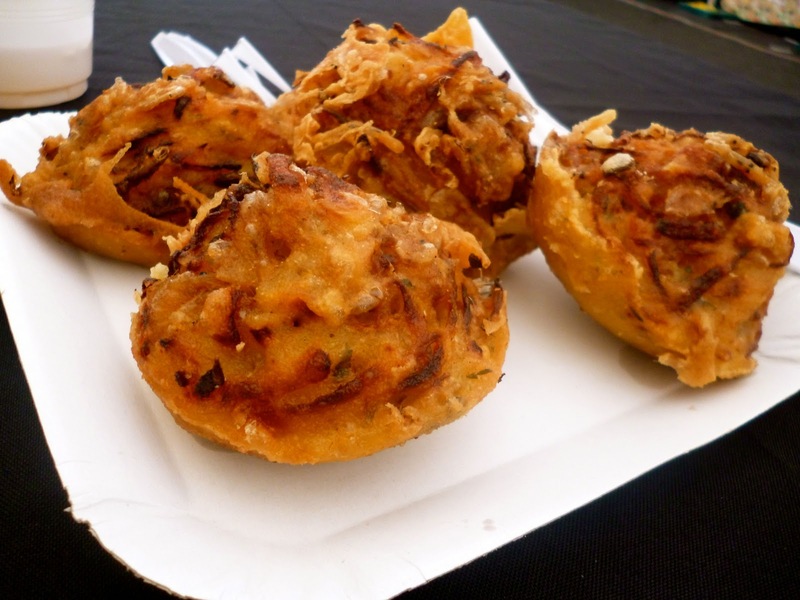 Okoy is a fried shrimp and potato fritter. I thought this was very tasty, and the stuffing of shrimp was generous as well. Thought this was a nice take on this dish. For those around the Alabang area, Soderno is a nice inexpensive alternative to the usual restaurants around the area. Though the place is much smaller than your usual weekend markets, there are still quite a variety of food stalls to choose from. Hi Elieen. Yes, you were probably able to make it extra crispy since you cooked it fresh. It definitely lacked crisp and was borderline tough when we tried it at Soderno.